Geek Balms! Potion on the go! ✨ There is an adventurer inside all of us. A warrior, a healer, a bard, you name it. We all long for those scenic views of mountain tops visiting strange peoples, or fighting a dragon in some icy plains. 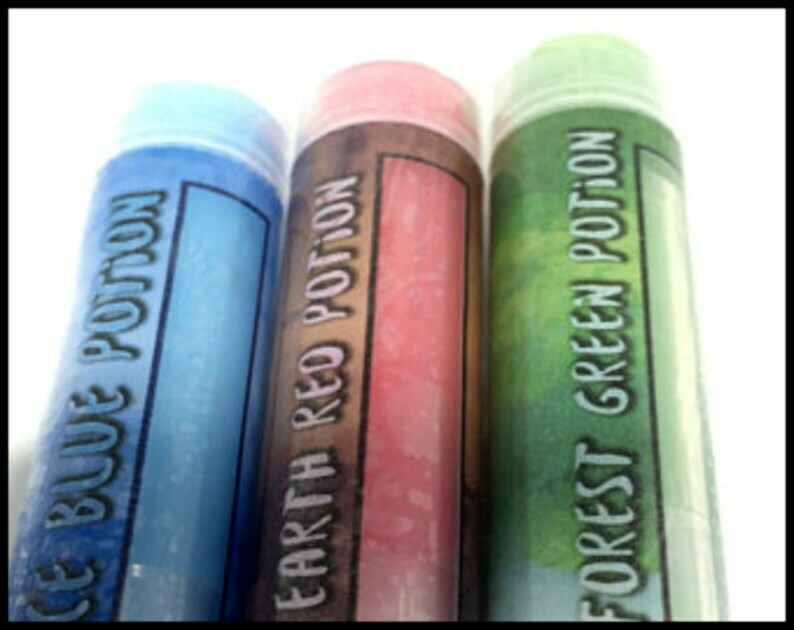 These lip balms will help carry you through your days as if they were potions brought from one of those lands. Each potion has a visible window, very similar to that of a magic meter or life bar, to help show how much you have left at all times. Great quality! I purchased all three potions and it won’t be the last time. I’m pretty picky when it comes to chapstick but this applies and feels great, it’s not too waxy and doesn’t bombard you with an overwhelmingly bad flavor like most other chapsticks. The potion indicator on the side is a clever idea and is actually very practical too! First off this is an awesome idea !! I love being able to know how much chapstick I have left. After receiving the lip balm I am already in love! it works great and I would highly recommend! It shipped fast and there were no hassles !! !